WITH DORA, DIEGO, YO GABBA GABBA AND MORE! What’s better than a DVD with ONE of your child’s favorite Nickelodeon characters? A DVD with SIX! This DVD has shows from the hit Nickelodeon series Dora the Explorer, Go, Diego, Go!, The Wonder Pets!, Blue’s Clues, Yo Gabba Gabba! and Ni Hao, Kai-lan. 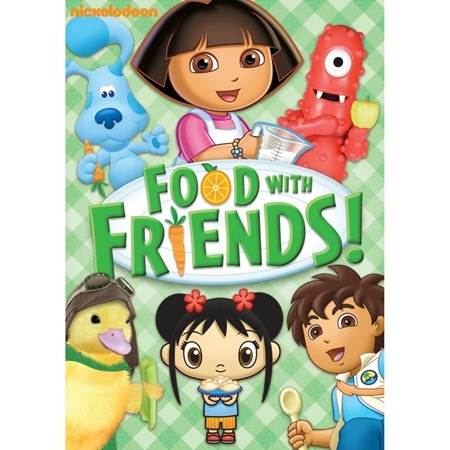 Explore and celebrate different types of food in the brand new DVD, Nickelodeon Favorites: Food with Friends. It’s Mother’s Day and Dora wants to help Papi bake Mamá a special cake. Three key ingredients are missing: bananas, nuts and chocolate, so with Boots’ help, Dora sets out to gather them. Then it’s time for a big Mother’s Day party with all of Dora’s friends and their mommies! It’s time for Abuelito’s Strawberry Festival, but when a strong wind blows all the strawberries away, Alicia must ask Diego for help. Green Iguana can save the day by transporting strawberry seeds in her belly and putting them into the soil so more strawberries can grow. They have to climb up trees to get to the top of the cliff, use stilts to get through the grass, swim through the lily pads and help iguana camouflage to hide from a scary animal. Most importantly, Iguana must get to Abuelito’s farm! The Wonder Pets shrink down to bee-size to help a baby bee collect nectar for her first hive. Later on, a piglet comes to live in the classroom and the Wonder Pets each want to take care of it on their own. Eventually, they realize they need to work together to take care of the rather large piglet. To find out what Blue wants to do outside, come help look for clues to learn the process of where orange juice comes from with Mr. Salt and Mrs. Pepper; investigate the elements of length and volume by comparing inchworms and puddles with Shovel and Pail; and categorize fruits and vegetables by where they grow with the felt friends. The characters learn the fun of eating vegetables and healthy meals. During “Party in My Tummy” and “Snacky Snack Snack” the vegetables beg to participate; and then the characters learn to try new things in “Try It You’ll Like It.” And finally, everyone learns that cleaning up their mess is just as fun as having a party in “Clean It Up”. It’s Chinese New Year, which means a big feast and red envelopes with friends and family! Kai-lan and her friends are thrilled because this year, they’re old enough to carry the huge dragon costume. Rintoo is assigned to march in the middle of the dragon but he doesn’t think the middle is important so he walks away. Without Rintoo, they can’t carry the dragon so Kai-lan must find a way to show Rintoo that every job on a team is important. In the end, the Dragon Team comes together to make the dragon dance and Yeye ends the day by giving a special red envelope to everyone. Emma and Ethan oftentimes fight over what show they want to watch. Emma likes Dora, Ethan prefers Diego. The beauty of this particular DVD is, they only have to sit through one storyline before they get to watch the story they wanted to watch! What’s even better is… they both like Yo Gabba Gabba and Blues Clues… no fighting there! The food theme is fitting for these guys as they are both very into helping in the kitchen measuring, pouring, mixing and baking. I love how these shows encourage sharing and working together (something we are still working on here) and the “Try It You’ll Like It” song from Yo Gabba Gabba has gotten a few reluctant bites from both of them… and they liked it! Disclosure: I received product for review purposes only. I was not compensated for this post. All opinions are 100% my own.